Poor Frank Lloyd Wright. America's best-loved architect just couldn't design a deathmatch level. Take his famous 1939 Kaufmann house, better known as Fallingwater. In 2006, Counter-Strike level builder Kasperg modeled Fallingwater in the Half-Life 2 Source engine. "Played like crap," one anonymous poster commented. "Spawn points got you stuck in the floor or walls, and the indoor environments got too cramped and corner-ey. ... Good for looking, but not touching." Isn't that just like an architect: never thinking ahead. Though Kasperg does design real Half-Life and Counter-Strike maps, he created the Fallingwater map as an experiment and learning exercise. The map proves current 3-D game engines can closely simulate real buildings. Next-generation engines will do even better. Slowly, architects - not software architects, the brick-and-mortar kind - are starting to notice. They're gradually repurposing 3-D computer game engines to visualize real-world building designs. This, friends, is a harbinger. Remember how machinima inspired the game community's budding filmmakers? Now, in the same way, the architectural use of photorealistic 3-D game engines heralds an imminent and exciting new pursuit. Of course, architects already use advanced modeling software, including (among many programs) Autodesk's 3ds Max, AutoCAD Architecture and Revit; Graphisoft's ArchiCAD; Bentley Architecture; Nemetschek's VectorWorks Architect; lots of specialized rendering and image compositing apps; and a long shelf of photo and model libraries. It's arguable that mastering these "building information authoring tools," in all their intricacy, is as formidable a challenge as designing a building. Indeed, nowadays much of the architect's job is engulfed in software. 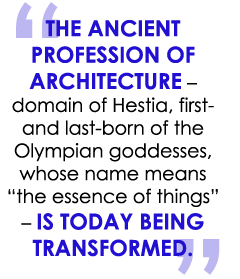 The ancient profession of architecture - domain of Hestia, first- and last-born of the Olympian goddesses, whose name means "the essence of things" - is today being transformed. Architects aim to improve construction efficiency through interoperability standards called Building Information Modeling (BIM). Right now, a design team of architects and engineers can't quite create a 3-D BIM file and then just e-mail it to a contractor for the humdrum task of instantiating it in steel and concrete. No, not yet - but that's where BIM is headed. All that is solid melts into air, or rather into bits. Much of today's practice of architecture, then, is 3-D modeling. Sites like CGArchitect ("The Global Community for Architectural Visualization Professionals") show how the profession is becoming, not a subsidiary, but a component specialty of digital visualization, the sprawling, hyperactive industry that encompasses manufacturing, illustration, special effects, animation and, incidentally, computer games. You'd think this would encourage a marriage of architecture and gaming. In comparison to game engines, architectural packages need heavy hardware, aren't optimized for real-time walkthroughs, and cost hundreds or thousands of dollars. As the Fallingwater map shows, a good game engine can achieve many effects seen in the high-end packages, in real time. It also brings bonuses like weather effects, and it costs $50 or less. So why don't architects use game engines? 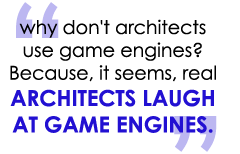 Because, it seems, real architects laugh at game engines. "To be honest, it's a niche field in both academia and architecture," says Dr. Andrew Hudson-Smith of the Centre for Advanced Spatial Analysis (CASA), University College London. "Indeed, it is viewed with suspicion by many, and it is a struggle at times to be taken seriously. Even when [I was] presenting 'When Architecture and Games Collide' at IMAGINA in Monaco amongst people from the industry, the inclusion of the word 'game' bought amusement from some attendees. It is only when they actually see the work that they realize the power and potential of gaming for architectural visualization. As such, most of the work is carried out by the modding community, rather than academics or professionals." CASA wants to change that. On his blog, Digital Urban, Hudson-Smith documents many projects, by both CASA and others, that visualize structures in game engines. "The idea came from two schools of thought," Hudson-Smith tells The Escapist, "firstly from my frustration with visualization inside 3DStudio Max (then version 7) while building our Virtual London model, and secondly, the cost of software to create real-time visualizations, especially in the architectural field."